I was recently awarded the Hugh Rogers Fellowship by the Melbourne and Boston Sister Cities Association. The fellowship supported my trip to Boston for two broad intentions. Firstly to promote relationships between the Melbourne and Boston artists and practitioners with a focus on Kadence Arts and Masary Studios led by percussionist Maria Finkelmeier. And secondly to help me to learn, network and develop personally as a musician, creator and educator through connections with North Eastern University and other institutions in Boston. This was the street I stayed on in Jamaica Plains. It was spring time but there was still snow piled up everywhere! Many of the houses had wind chimes by their front door which made for a beautiful soundscape on the way to the train everyday. During my two weeks in Boston I spent much of the time working with the members of Masary Studios including Maria, Ryan Edwards (a specialist in West-African drumming) and Lighting Artist Sam Okerstrom-Lang (who is also the director of TEDX Cambridge). We had an intensive period of initial work-shopping and brainstorming that resulted in an exciting outline for a new project. We will be working towards dealing with issues surrounding climate change in an immersive, large scale performance featuring huge light projections and live music. Stay tuned for updates as we begin the process of applying for grants to fund the next stage of development! While in Boston, I made it my mission to see as many performances as I possibly could to help inform my own concert design and curation. From a hip hop/performance art event, to the Boston Symphony with Yo-Yo Ma, I was very fortunate to see a huge range of concerts. One of the highlights was the Boston based string ensemble A Far Cry. The ensemble played a program of brand new compositions (written by the players) inspired by the beautiful Isabella Gardner Stewart Museum, the works were fresh, contrasting and inspiring. The Fromm Players at Harvard performed an incredibly powerful program of works curated by their Professor of Music Chaya Czernowin. A particularly interesting performance was Justin Timberlake’s latest tour ‘Man of the Woods’. The lighting component of the huge stadium show featured live projections on scrims which were an inseparable part of the stage and presentation. Seamlessly blending all elements of a performance is an aspect of concert making that fascinates me, it was great to see how this was dealt with over a variety of genres. Conference of the Birds was a contemporary dance work presented by Anikaya. The piece was based on an ancient Persian poem about the soul's search for meaning told through the journey of 30 birds. I met up with a Euphina Yap studying at Boston Conservatory and was got my percussion nerd on in a TROMP competition masterclass chaired by Nancy Zeltsman and Garrett Mendelow. 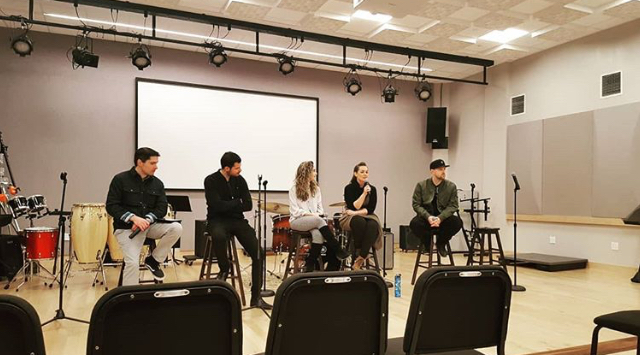 I crashed the Berklee College of Music Career Day to hear Maria talk on a panel about her entrepreneurial approach to life as a portfolio based musician. We had lots of delicious meals at Maria's place featuring their colourful crockery! The work that Maria and the Masary Studios present is a dynamic take on classical new music, cross genre collaborations, sonic installations and performance art. Their most recent projects, all available to see on their website, are exciting explorations of light, colour, performance, composition, improvisation, sound and audience engagement. While in Boston, I was fortunate to have the opportunity to meet with performers, arts administrators, researchers, educators and composers at Boston Conservatory, New England Conservatory, North Eastern University, Harvard, Boston Foundation and more. I also spent a great deal of time on the Red Line (which is where the Handmaid’s Tale was filmed!). I am very grateful to the Hugh Roger’s foundation for their support of this trip, I have returned feeling invigorated and inspired by fresh new ideas and approaches to performance making. I am really looking forward to delving into this project with my new Boston collaborators at Masary Studios!